This item is for all of us as we attempt to rely on our local utility companies to keep our lights on. 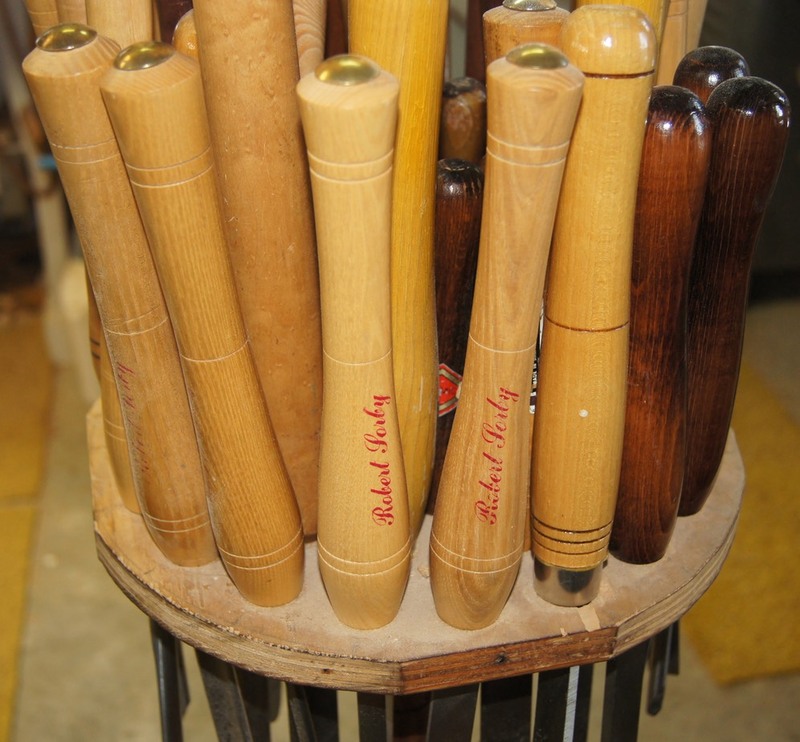 Are you running out of space to put your lathe tools? I was and I was really getting tired of picking them up off the floor when they rolled off what ever I had put them on. This unit is a double decker lazy susan. Each tray will hold 40 tools. As you load this baby up, you will start to remember where they are and what order they are in. This really helps get the right tool the first time. I have two lathes running so I put this unit between the two and it's very handy. 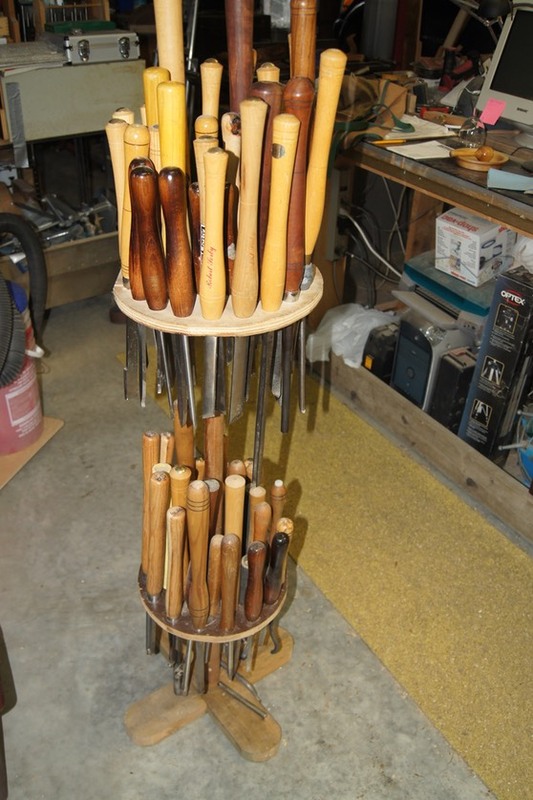 The unit is 42" tall, the center shaft is 1 1/4" dowel with a 18" base. The top tray will spin easily and if you space the trays right, the top tools don't hit the handles below. 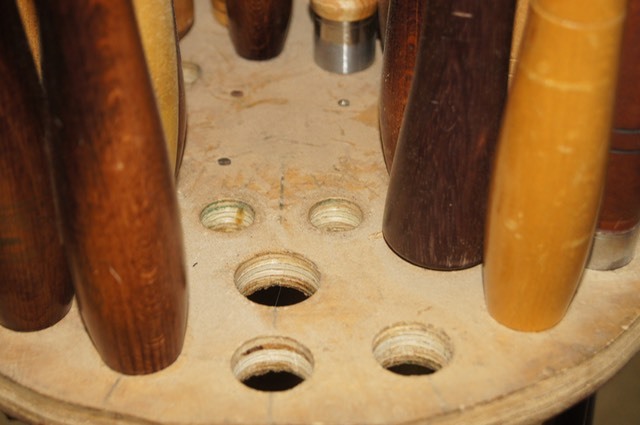 To accommodate all the various sized tool handle ferrule you need to bore different sized holes. My top tray has 3 rows of holes. This keeps things in their proper location. This type of base is very stable and takes up less than 4Sq. Ft. of floor space. Have you ever had the need to cut a perfect ball? 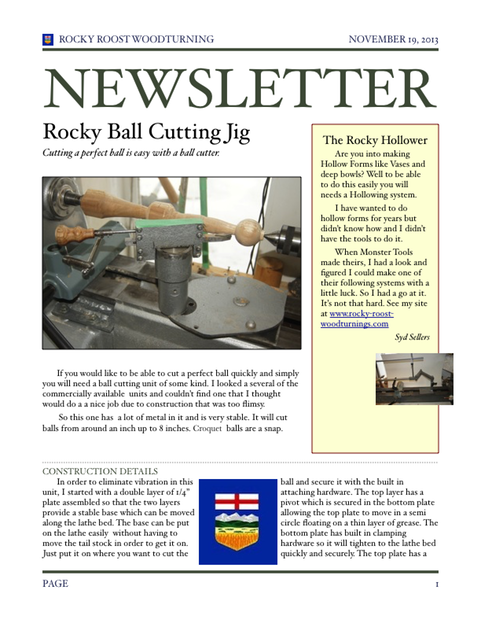 Well I sure have and my free hand cutting of a ball has never been very good. I have seen a few ball jigs for sale but they really never turned my crank. 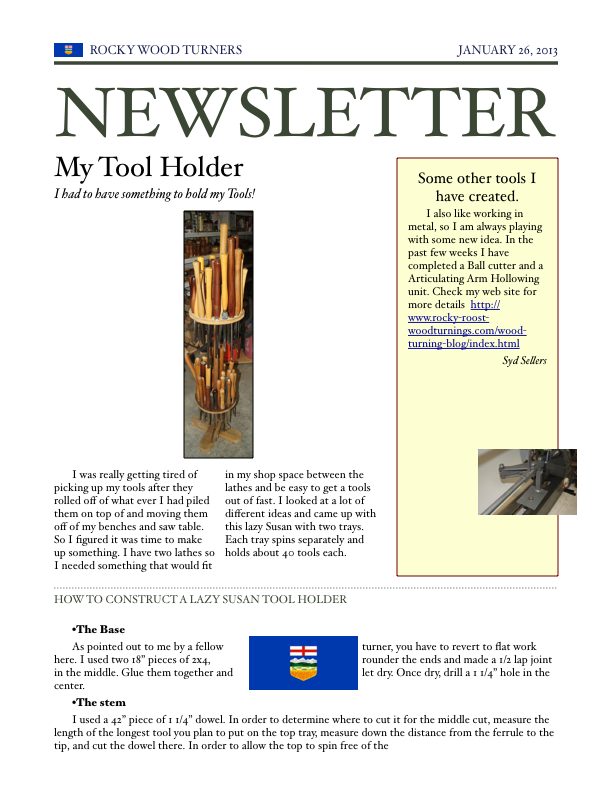 So I had a run at making one that fits my lathe. 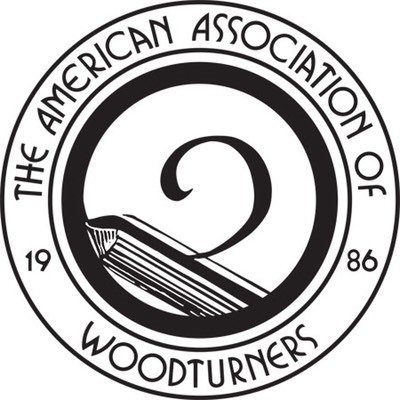 The cutter has to be at the correct height and sharp enough not to tear the wood. 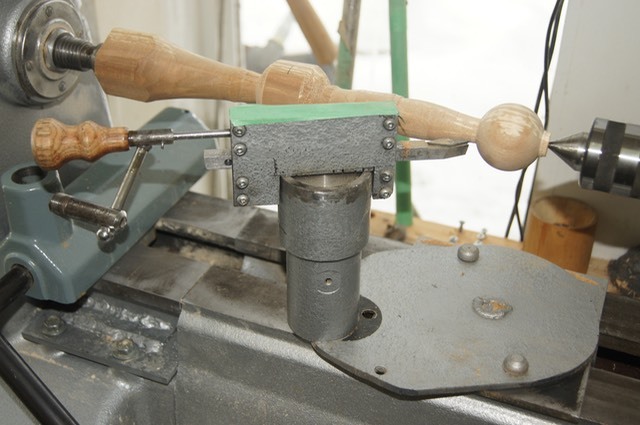 I built this unit around the Easy Wood Tools profile cutter as seen here. This example is soft Silver Birch that is spalted and as you can see there is very little torn end grain. 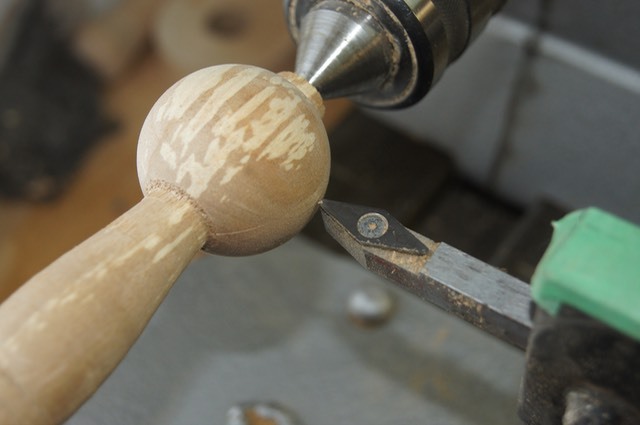 If your work piece is held by a chuck, the tail stock will be pushed back and the ball can be cut all the way around on the Tail Stock end. 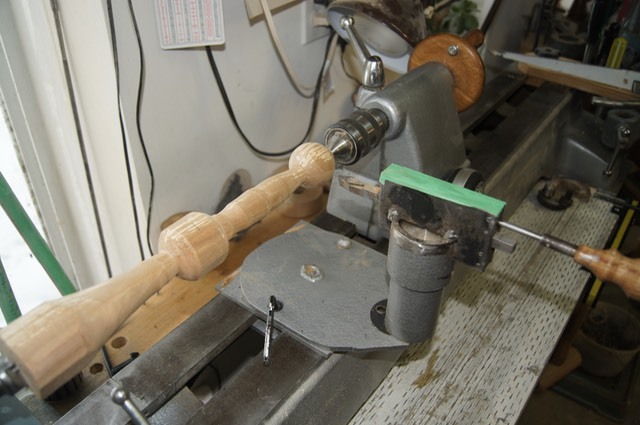 As you can see, I have a unit that attaches to the lathe bed, it has two layers that allows the bottom one to be moved along the bed and tightened where ever you like. The top layer then pivots a full 360° if you need it. 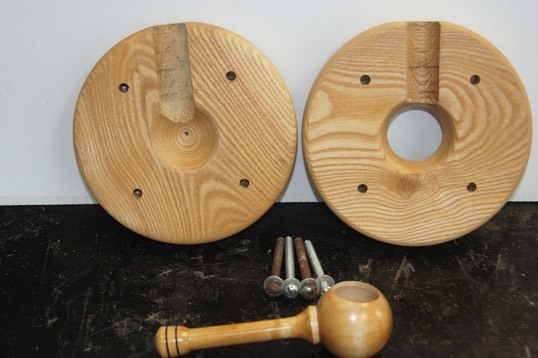 The depth of cut is adjustable by the wooden knob on the left and the size of ball can be any thing from less than an inch to a full 10". So Croquet and Botchy balls are possible. I had to make a cross slide assembly in order to adjust the cut depth easily. 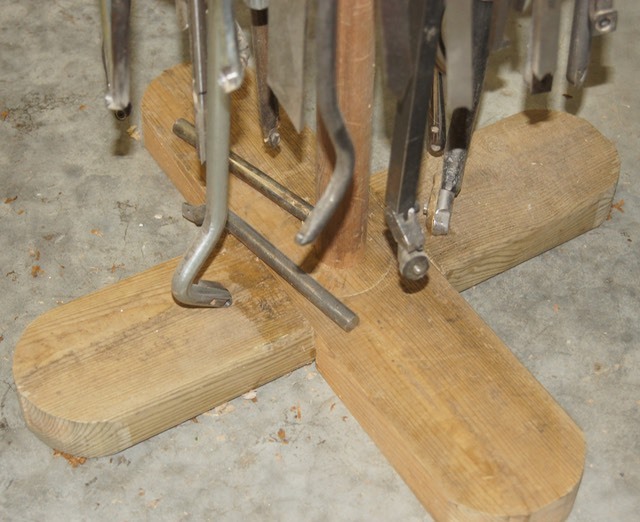 The bed attaching hardware can be tightened with an Allen key by pulling the plugs out of two holes on the top plate. The plugs keep the wood chips from plugging the Allen key sockets. Details on how to make this unit are available below, or send me an e-mail. 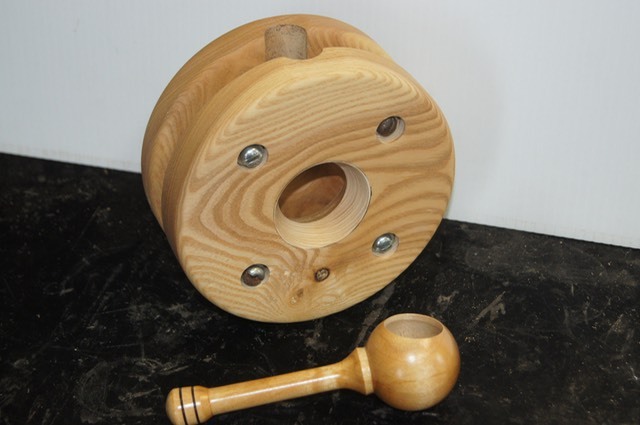 I have been making Coffee Mills for several years, so when I saw a writeup in the Woodturning Design on how to make a scoop with great instructions on how to make the required chuck to hold them I just had to give it a shot. 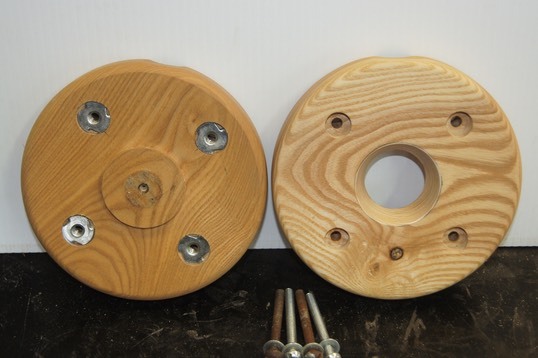 As you can see, the chuck is made of wood (Black Ash) and has 4 1/4-20 tpi screws that thread into T nuts on the back side. These screws pull the two haves of the chuck together holding the already turned scoop. The handle of the scoop fits in the hole that runs to the outer edge. Once in place, you hollow out the scoop to the capacity you want, in my case 1/8 cup.